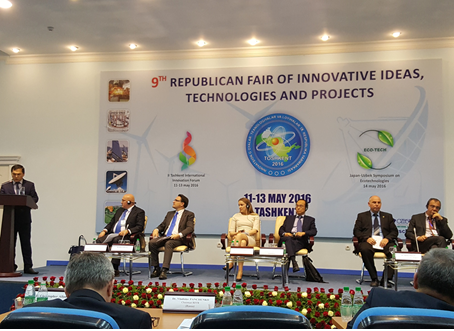 CCSTD (Committee for Coordination of S&T Development) of Uzbekistan has organized anInternational Innovation Forum on May 11-13 in Tashkent, Uzbekistan. Among the invited participants to share their multiple experiences amongst countries from U.S.A., U.K., Germany, Korea and many other countries. After 2 days of presentation and discussion, participants of the forum recognized that reforms conducted in Uzbekistan in the field of government support of scientific research and organization of innovation activities produced a tangible result. High international level studies are carried out in the field of genetic engineering, biotechnology, cellular technology, chemistry, and material sciences. In order to further improve the mechanisms to support innovation activities in Uzbekistan, the participants of the forum recommended 12 suggestions to the government of Uzbekistan and relevant issues with KISTI are as follows: In order to organize the information flow for the development of innovative economy to provide access for the development of innovative economy to provide access for the scientific community of Uzbekistan, explore the experience of KISTI including the analytical service tool "COMPAS" is highly necessary. with the Ministry of Science, Technology and Telecommunications of the Republic of Costa Rica(MICITT) on July 14th at MICITT's office. This agreement aims to intensify mutual cooperation on science and technology between two countries and has its special focus on NTIS, National R&D Information Management System of Korea this time. 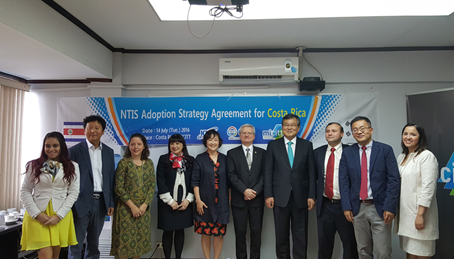 In line with this regard, KISTI and MICITT have agreed to conduct feasibility study in advance before ting the project proposal for establishing NTIS in Costa Rica. At a Kick-off meeting held in MICITT, Dr.Marcelo M.Jenkins, the Minister of MICITT has emphasized the importance of getting the cooperation from the universities mainly involved in R&D projects of Costa Rica to make this feasibility study successful. Dr.Hahn Sunhwa, President of KISTI has also said that KISTI will make the most of its experience and know-how acquired from the process of establishing NTIS in Korea. KISTI held 4th Korea-Vietnam workshop for S&T Information in Hanoi on March 15th. Thisworkshop was held in cooperation with ISI(Institute of Science and Technology Information) and IOIT(Institute of Information Technology). KISTI has presented its R&D on information service, high-performance research network and COMPAS(Competitive Information Analysis Service) to scientists and researchers of VAST(Vietnam Academy of Science and Technology). 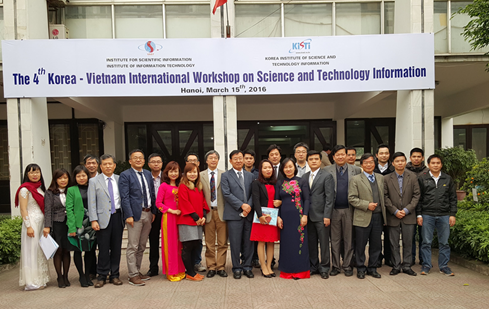 As science and technology ODA program, KISTI has been co-organizing S&T workshop with Vietnam to share its knowledge and experience KISTI has been building up for the past 53 years on national S&T Knowledge Infrastructure. KISTI announced that it will expand GSDC(Global Scientific Data Center) data bandwidth to 10Gbps. Korean scientist can receive LHC source data 10 times faster than now and real-time utilization of its data is expected to improve the competitiveness of R&D on basic science. By building up 10Gbps data bandwidth between Daejeon and Geneva, KISTI can transmit 1 PB data in 23 days which took 289 days with 2Gbps before. The expansion of 10 Gbps is a follow-up action of CERN’s approval on April, 2014 of Tier-1 center for Ministry of Science, ICT and Future Planning(MSIP) and KISTI. 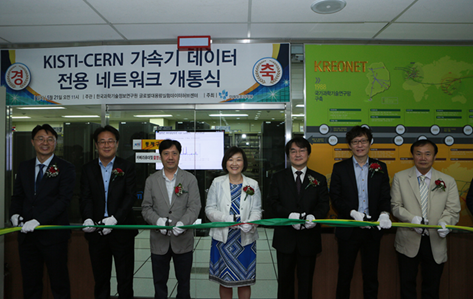 KISTI expanded the bandwidth of Daejeon-Chicago section to 10Gbps and secured Chicago-Geneva section by collaborating with “SURFnet” of Netherlands. Korea scientists were not easy to access to CERN In the meantime, Korean scientists were not easy to approach CERN and used to suffer from data delay till now. 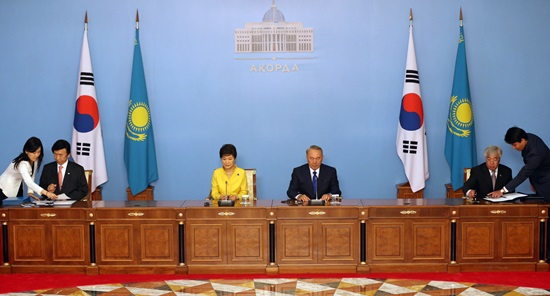 On the 19th of June, President Park Geun-Hye and her Kazakhstan counterpart PresidentNursultan Nazarbayev had a summit meeting in Astana, Kazakhstan. The summit is the 12th between the leaders of two countries, since the two countries formed bilateral ties in 1992. During the summit meeting, the construction of a thermal plant and petrochemical complex was raised as main discussion points, as well as medicine cooperation, visa waiver and so on. Along with the national agendas, Ministry of Science, ICT and Future Planning (MSIP) of Korea and Ministry of Education and Science (MES) of Kazakhstan signed a MOU for KOR-Kazakh national R&D Information System construction. The cooperation on building Kazakh's national R&D Information System will be based on Korea Institute of Science and Technology Information (KISTI)'s NTIS system. Upon the request of NCSTE Kazakhstan, an evaluating institute for science and technology, KISTI will actively participate in the construction. KISTI and NCSTE will be going through a feasibility study on the system's construction, starting September 2014. Both parties will be able to plan ahead for building a solid R&D Information System, to boost Kazakhstan's scientific and technological advancement.